Looking for a great way to conserve water while having something a little different? Sunken garden designs can make this possible. What is a Sunken Garden Bed? So what is a sunken garden bed? By definition this is “a formal garden set below the main level of the ground surrounding it.” Gardening below ground level is not a new concept. In fact, sunken gardens have been used for centuries – most commonly when the availability of water is limited. Areas prone to dry, arid conditions, such as desert climates, are popular sites for creating sunken gardens. Sunken gardens help conserve or divert water, alleviating runoff and allowing water to soak into the ground. They also provide adequate cooling for plant roots. Since water runs down hill, sunken gardens are created to “catch” available moisture as water runs down the edges and onto the plants below. Plants are grown in a trench-like setting with hills or mounds in between each row. These “walls” can further help the plants by providing shelter from harsh, arid winds. Adding mulch to these sunken areas also helps retain moisture and regulate soil temperature. A sunken garden bed is easy to create, though some digging is required. Creating sunken gardens is done much like a typical garden but instead of building the soil at or above ground level, it falls below the grade. Topsoil is dug out of the designated planting area about 4-8 inches (may go up to a foot with deeper plantings) below grade and set aside. The deeper clay soil beneath is then dug out and used to create the small hills or berms between rows. The excavated topsoil can then be amended with organic matter, like compost, and returned to the dug-out trench. Now the sunken garden is ready for planting. Note: Something to consider when creating sunken gardens is their size. Typically, smaller beds are better in areas with less precipitation while climates receiving more rain should make their sunken gardens larger to avoid over-saturation, which can drown plants. 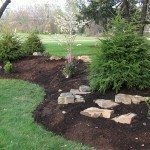 In addition to a traditional sunken garden bed, you may choose to create one from an existing in-ground pool, which can be filled about ¾ of the way with a dirt and gravel mix along the bottom. Rake the area smooth and tamp down until nice and firm. Add another 2-3 feet of quality planting soil over the gravel-fill dirt, firming gently. Depending on your plantings, you can adjust the soil depth as needed. 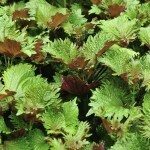 Follow this with a good layer of topsoil/compost mix, filling up to 3-4 feet below the surface of the pool walls. Water thoroughly and allow to stand a few days to drain prior to planting. Waffle gardens are another type of sunken garden bed. These were once used by Native Americans for planting crops in dry climates. Each waffle planting area is designed to catch all available water to nourish plant roots. Start by measuring a 6 ft. by 8 ft. area, digging as you would an ordinary sunken bed. Create twelve planting “waffles” approximately two feet square – three waffles wide by four waffles long. Build berms or mounded hills between each planting area to create a waffle-like design. Amend the soil in each planting pocket with compost. Add your plants to the waffle spaces and mulch around each.